Our planet is full of natural and man-made energies. The natural energies should be mainly positive, but over time many have become distorted, filling up with negativity for a variety of reasons. Negative, distorted energy rays cause all kinds of health problems for all living things, particularly if they run through the ground of buildings. Many people have heard of ‘Sick building syndrome’, felt uncomfortable in certain houses or work places and have felt that the atmosphere is oppressive in some way. Within the Earth there are distorted Geopathic Stress rays (GS), negative energy blockages and negative sink places. Over the last 100 years, man has added far more electromagnetic Stress (EMS) due to all the new technology in and around our homes and places of work. GS is natural radiation that rises up through the earth and is distorted by weak electromagnetic fields created by subterranean running water, certain mineral concentrations, fault lines and underground cavities. The distorted vibrations become abnormally high and harmful to living organisms. Geopathic Stress does not cause an illness, but lowers your immune system, so you have less chance of fighting any illness. GS also prevents your body absorbing properly vitamins, minerals, trace elements etc. from your food (and supplements) and often making you allergic to food, drinks and environmental pollution. We are all made up of energy and everywhere we go, we leave a tiny bit of that energy behind. It can be positive or negative, this very much depends upon our health, state of mind and the way we think. Thoughts have a huge impact – so the more positive the better! When there is good health, happiness and love, the energy left behind is positive. If on the other-hand there is illness, depression and sadness, the energy left will be negative. When bad news is received, the area where it is heard will absorb the negative energy. Where terrible events such as battles, abuse, traumatic incidents, murders etc take place, negative energy will develop and over time build up to become much more negative. This means that rays that were once positive, may have changed to become negative. It all links in with the GS and EMS rays. Where GS is particularly bad, there will also be negativity. When the negativity is extreme, a negative energy blockage develops. Very often I find an energy blockage at the intersection of 2 GS rays. This not only causes problems for health, it tends to be a blockage for anything. It may be that nothing seems to go right, people feel blocked in all ways. The blockage needs to be cleared first, then healing can be directed to the rays to change them back to positive, and for the walls of a property to guard against EMS. If there is a sink place inside a property, this also needs to be cleared and then monitored regularly to ensure that it remains clear. If it is away from the house or office, it does not need to be cleared as often. In my initial dowsing, I also check for something that I call Geopsychic Stress, to see if there is a trapped spirit or presence. If so, this needs to be cleared before any other work commences. I work with the Angels to send them to the light. Releasing them, almost always raising the vitality of the property, even before starting the other clearance work. I distance dowse a person’s sleeping position to see how badly affected by negative energies they are. I also dowse their Hertz vibrations. This analysis is completely ‘Free of Charge’. The work involved may take anything from a week to three weeks , depending on the severity of the problem. I give each property one healing session a day. Once the healing has been completed, people living in the property usually notice a real ‘change’ or ‘shift’. It generally feels much lighter and the vitality within the property will have risen. I have also found that the Angels can put a healing barrier into the walls of a house to help repel EMS from the outside environment. Once a house or work-place has been completed I send a report with a copy of my dowsing readings taken before and after healing. People find their sleep patterns have usually improved, along with a general sense of well being. However, a persons raised Hertz vibrations may take up to 6 weeks to return to the normal level and some people will not notice a difference until then. Once clearance is completed, I invoke St Germain and the violet flame Angels to transmute any remaining negativity. 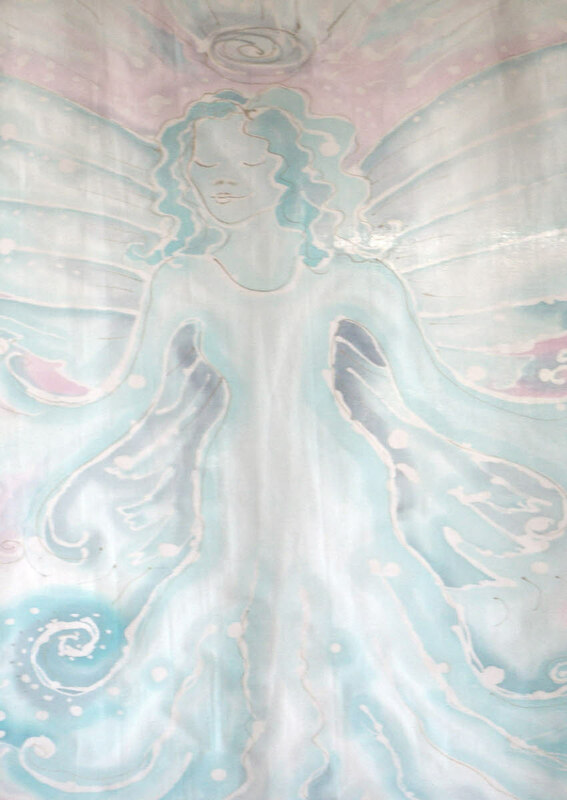 The Angelic healing raises up all the energies, creating a nurturing supportive space with increased vitality.